Introducing our key features; The Bridal Market - The largest marketplace in Malaysia for brides-to-be to happily source for Hotels, Restaurants & many other Wedding-Related Services. Stress-free, fun & hip - all under one roof! Source everything you need here from Malaysia's Best Wedding Suppliers - Wedding Gown, Wedding Dress, Wedding Shoes, Wedding Jewellery, Wedding Live Band, Wedding Planner, Wedding Decoration, Florists, Bridal Make-up, Photobooth, etc. 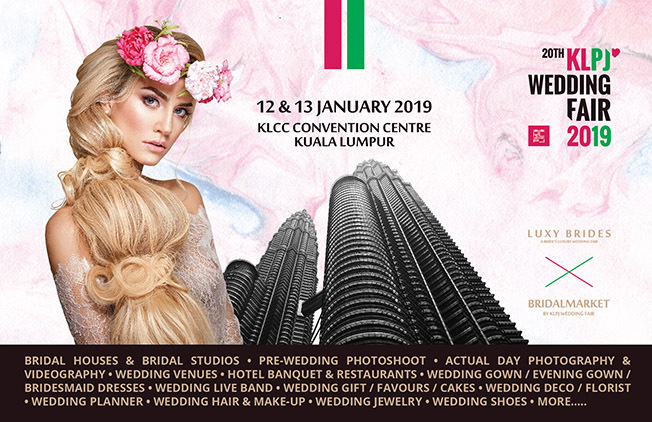 Incorporating Pameran Pengantin Kahwinje (Malay Wedding Fair) & Shaadian (Indian Wedding Fair), KLPJ Wedding Fair is now an integrated wedding community targeting the Malaysia's 3 main races (Chinese, Malay & Indian) and also the very niche market in Malaysia; couples & brides-to-be. A 3-days face-to-face marketplace with targeted 55,000 customers with valuable content, engagement & experiences. Please visit www.klpj.com.my to view all exhibitor profiles.